Rosewood Memory Care provides a modern senior living community with all the amenities to help residents feel comfortable, taken care of, and excited to greet each new day. Our Hillsboro Memory Care community is secured to put your loved one in the best space possible, and put your mind at ease. 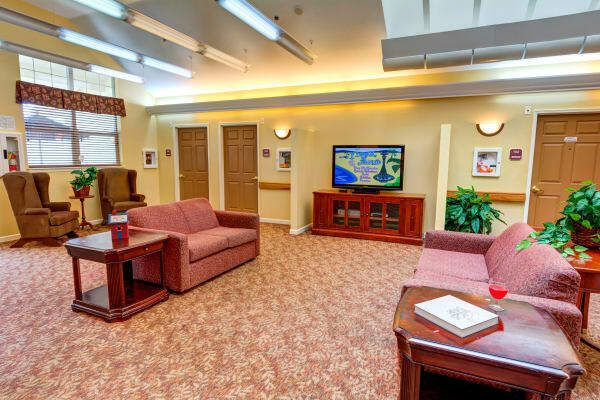 Shared spaces indoors and out provide opportunities for residents to interact with others, whether they’re gathered around for a movie in a community living room, participating in our Life Enrichment program activities together, or simply taking a walk around our enclosed grounds. Our team members, like our residents, are one-of-a-kind. No matter their role here, each staff member is dedicated to offering excellent services in a personal, compassionate way. Residents here receive whatever assistance they need with activities of daily living, such as going to the bathroom, bathing, and getting dressed. We also take care of everyday tasks and chores like laundry, trash, and housekeeping. At Rosewood Memory Care, mealtime is always something to look forward to. You can count on us to deliver meals that are fresh and delicious in an atmosphere where your loved one will feel comfortable and catered to. To find more information on our offerings, talk with one of our team members today. We’d be happy to receive your call, and schedule your personal tour.